Parents are on high alert in the East Valley after another report of a white van following kids. ABC15's Danielle Lerner has more. 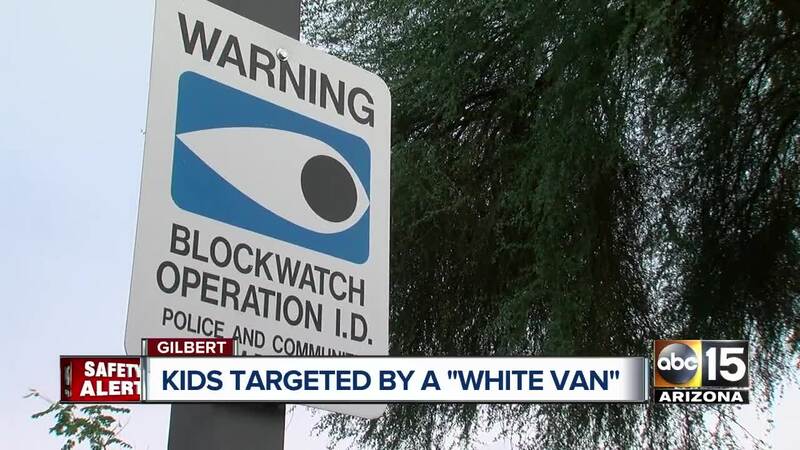 Parents are on high alert in the East Valley after another report of a white van following kids. This comes as Gilbert police are still investigating the possible attempted kidnapping of a 12-year-old girl from last week. That case also involved a white van. On Thursday morning, Gilbert police released a sketch of the subject who followed the 12-year-old girl. Wednesday morning’s incident happened at a bus stop less than a mile away from last week’s incident. A young girl waiting there with her sister saw a white van, remembered recent reports and took off for another bus stop. Habeba Saleh rides the bus to Quartz Hill Elementary school every day. Her stop on South Allen Avenue and East Phelps Street is always packed with kindergartners through sixth graders. “I’m like the second oldest there,” Saleh said. Wednesday’s ride to school was different as Saleh’s best friend recounted some unnerving events. The girl reported it to school staff who notified police before sending a tweet and a notice for parents. “I’m happy that they have phones so we can check on them because it’s really scary,” said Habeba’s mom, Manar Saleh. The neighborhood is now tracking every development. Last week, near Williams Field and Lindsay Roads, the girl involved asked the man in the van for a password and took off when he didn’t have it. That step is now sparking new and ongoing conversations in this tight-knit community. “We’re going to talk more to our kids about it,” Manar Saleh said. “I’m going to be cautious and keep the little kids in a group and just stay with them to be safe,” Habeba Saleh said. At this point Gilbert police does not think anything criminal happened at the bus stop but because of recent events, including another van scare back in June , the department is investigating. Anyone who sees anything suspicious should call police right away.